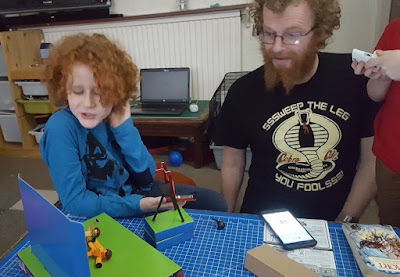 StikBots are great fun and we've reviewed them several times now. They are little poseable figures with sticky pad hands and feet, which are designed to be perfect for creating animated movies. There are lots of different themed sets available for amateur film-makers aged 4+ and I'm delighted that Brainstorm Toys (StikBot UK Distributor) have kindly offered 3 StikBot Movie Sets as Christmas presents for my readers. 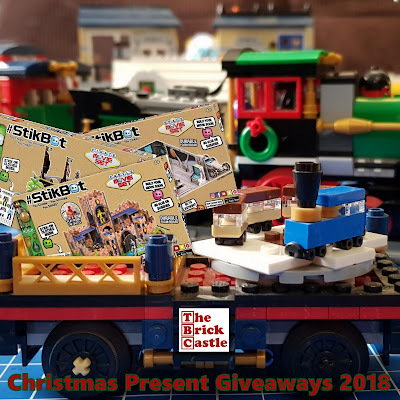 Inside each box is not only the StikBot, but press out thick glossy card pieces to create scenery, backdrop, props and small plastic accessories to complete your scene. They're attractive, clever and don't need any glue or tape. We've had a lot of fun with StikBots. There is a free to download app. which is easy to use and creates simple stop-motion animation. This was our first video, which is only a minute long and is a compilation of several different movies we made. I think we did okay! StikBots are great. They're easy to move and stay where you put them most of the time. The sticky hands and feet will grab anything smooth and the accessories are all instantly recognisable and great tools for leading your storyline. StikBots encourage imagination and creativity, while teaching patience and care, and your child can very quickly create something they can be proud of. 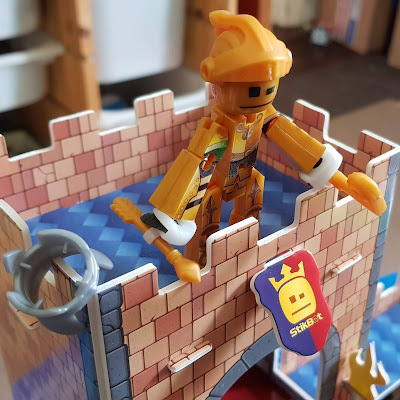 You can find my StikBot reviews here..
StikBot Movie Sets are available to buy now priced a very reasonable £21.99rrp from all good toy and game shops, including online at Amazon*. For more information about the entire range available see the official StikBot website, where you'll also find printable clothes, games and videos, as well as information about the free stop-motion animation app. 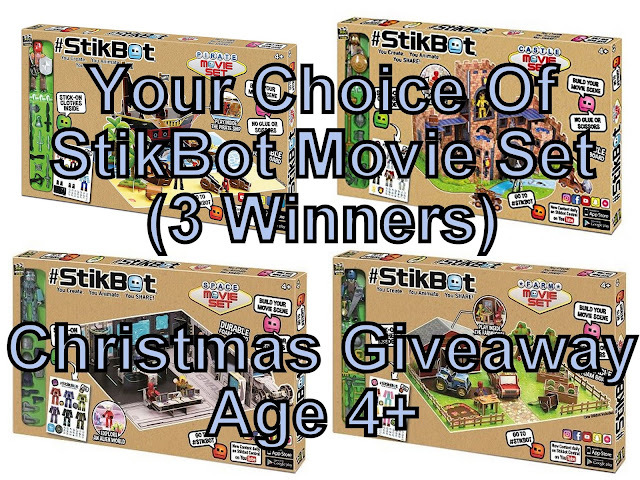 Brainstorm Toys have offered 3 StikBot Movie Sets as Christmas Presents for my readers. The winner(s) can choose which sets they would like (subject to availability) and I will allow repeat winners, so if you are drawn twice you can even choose different sets. Entry to the giveaway is by Gleam form below. No entries are mandatory, but each extra task performed earns extra entries into the random draw. Your personal information will ONLY be used to administrate this giveaway and the winner is drawn at random. We were sent our original StikBots sets for review from Zing Toys and Brainstorm Toys (UK Distributor). *Amazon links are affiliate, which means I earn a few pence as a thank you for my time if you order through my link, but you don't pay any extra. I would like to film Jurassic World in miniature and I would shrink The Rock to lead the cast. Star Wars or the Indiana Jones moves - love them all! Well my granddaughters would be in the cast of a rip roaring adventure movie. I would like Harry Potter with hermione as the lead. I'd like to film a James Bond film in miniature with me in a starring role. I think it would be really cool to film Jaws, of course would have to shrink the shark! Firefly! So I'd be shrinking Nathan Fillion, obviously! Star Wars, and not an actor as such, but I'd want to shrink Yoda to be on the set! would love a model of Rome from all the ancient movies and known layouts of the 1st century city capital of the known world!! I’d recreate minions and I’d shrink the kids to put in it!!!! I would love a horror movie set and Pennywell and Jason as my cast. I think I would do a teeny tiny version of Lion King and shrink down the little animals. 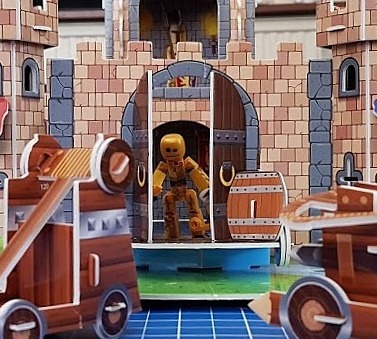 StikBot Movie Sets are brilliant - which movie set or film genre would you like to film in miniature, and who would you shrink to have leading the cast? The Hobbit, with a gorgeous shrunken Richard Armitage. I would love to do The Goonies and shrink down chunk and the entire cast #HeyuGuys! I would like to make a Bat man film and My grandson could be Bat man! Old fashioned cowboys and indians starring Clint Eastwood. Probably ET, would shrink Donald Trump to make the alien and send him back off into space. Return of the Jedi - id shrink Yoda - he would be tiny! Harry Potter ad I would shrink the twins as Harry and Ron, luckily they are not identical! Think it would have to be Moana. I would shrink my daughter to be Moana and my hubby yo be Maui as they both do good impressions of both. Dirty dancing with Zac Effron as the lead.